The Buds is worked over 23 stitches. Row 1: P5, M3, p4, 3/2LPC, p8. Row 3: P5, k1, M3, k1, p6, 3/2LPC, p6. Row 5: P5, k2, M3, k2, p8, 3/1LPC, p5. Row 7: P5, k7, p9, 3/1LPC, p4. Row 11: P5, CO, p11, 3/1LPC, p2. Row 13: P4, 3/1RPC, p1, 3/2LPC, p10, k3, p2. Row 15: P3, 3/1RPC, p4, 3/2LPC, p7, 3/1RPC, p2. Row 17: P2, 3/1RPC, p7, 3/2LPC, p4, 3/1RPC, p3. Row 19: P2, k3, p10, 3/2LPC, p1, 3/1RPC, p4. Row 21: P2, 3/1LPC, p11, 4/3LC, p5. Row 23: P3, 3/1LPC, p10, k7,p5. Row 25: P4, 3/1LPC, p9, k7, p5. Row 27: P5, 3/1LPC, p8, ssk, sl2-k1-p2sso, k2tog, p5. Row 31: P8, 3/2LPC, p10. Repeat Rows 1 - 32. M3: (K1, K1-tbl, K1) all in one stitch. 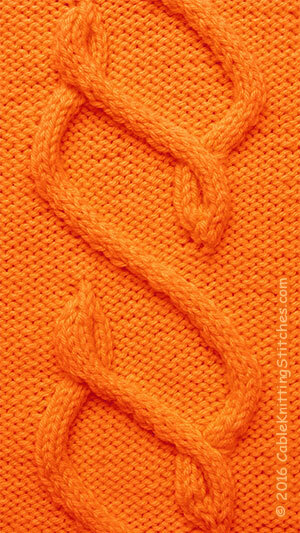 SL2-k1-p2sso: Slip 2 sts together, knit1, pass the slip sts over. CO: Slip 3 sts to CN, and hold in front, slip next stitch to second CN and hold in back. K3, then P1 from CN held in back, K3 from CN held in front. 4/3 LC: Slip 4 sts to CN and hold in front, K3, then K4 from CN. 3/1 LPC: Slip 3 sts to CN and hold in font, P1, then K3 from CN. 3/1 RPC: Slip 1 st to CN and hold in back, K3, then P1 from CN. 3/2 LPC: Slip 3 sts to CN and hold in font, P2, then K3 from CN. 3/2 RPC: Slip 2 sts to CN and hold in back, K3, then P2 from CN.